The demolition of the old Mount Begbie Elementary school building is underway. Sep. 28, 2016 7:00 a.m.
An excavator makes quick work of the demolition of Mount Begbie Elementary on Wednesday morning. 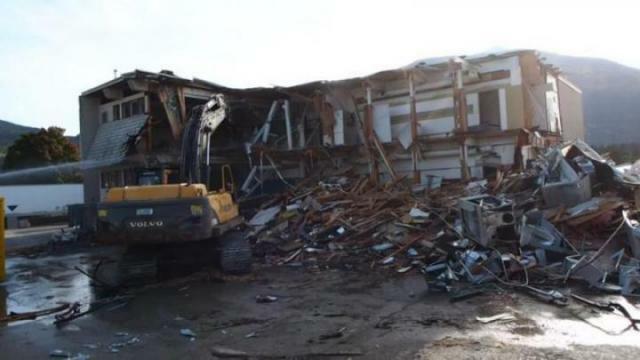 The demolition of Mount Begbie Elementary is underway, with contractor Clearview Grinding taking its excavator to the building Wednesday morning. Mount Begbie Elementary shut its doors to students at the end of the 2011-12 school year. The Revelstoke School District is tearing down the building to make way for re-development of the site. The City of Revelstoke is hoping for medium-density residential development on the Southside property. Check out a video of the demolition above.